Schneider’s committee assignments recognized her environmental expertise. She served on the Committee on Merchant Marine and Fisheries and the Committee on Science, Space and Technology. In the 98th Congress (1983–1985), Schneider was appointed to the Select Committee on Aging—an appropriate appointment, as Rhode Island had the second oldest population in the country.19 Her differences with President Reagan often translated into differences with the Republican Party leadership in Congress, which consequently excluded her from some important committee assignments. 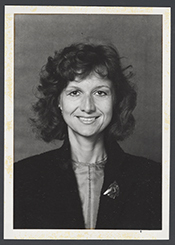 For the 101st Congress (1989–1991), she lost a bid to the prestigious Energy and Commerce Committee, the prime forum for the discussion of environmental issues.20 Schneider rose to Ranking Member of the Science, Space, and Technology Committee’s Subcommittee on Natural Resources, Agricultural Research, and Environment. 1“Schneider: Ex–Rep. Again Ill With Cancer,” 8 April 1999, National Journal. 2William K. Gale, “Claudine’s Back in Town–Ex–Congresswoman Returning to Give a Speech,” 17 April 2001, Providence Journal Bulletin: 1F. 3Margot Hornblower, “Charging In,” 22 December 1980, Washington Post: A1. 4David R. Mayhew, Placing Parties in American Politics (Princeton, NJ: Princeton University Press, 1986): 24–27. 5Politics in America, 1990 (Washington, D.C.: Congressional Quarterly Inc., 1989): 1349; Colman McCarthy, “Bridging the East–West Gap,” 28 December 1986, Washington Post: A1. 6Politics in America, 1990: 1349. 7Mayhew, Placing Parties in American Politics: 27. 8Politics in America, 1990: 1349. 9Kathy Sawyer, “More Women Seeking Office In rsquo;80 Election,” 14 October 1980, Washington Post: A1; A.O. Sulzenberger, Jr., “More Women Than Ever May Win Congress Seats,” 1 September 1980, New York Times: A1. 10Politics in America, 1990: 1349. 11Luica Mouat, “Women in Politics: Steady Progress,” 6 November 1980, Christian Science Monitor: 8. 12Politics in America, 1990: 1349. 13Ibid., 1348; “Election Statistics, 1920 to Present,” http://history.house.gov/Institution/Election-Statistics/Election-Statistics/. 14Politics in America, 1990: 1347. 15Almanac of American Politics, 1990 (Washington, D.C.: National Journal Inc., 1989): 1090. 18Politics in America, 1990: 1347; Steven V. Roberts, “G.O.P. ‘Gypsy Mothers’ Test Their Wings,” 26 July 1981, New York Times: E4. 19See Catherine Foster, “Rhode Island Senate Race Takes Politeness Prize,” 26 October 1990, Christian Science Monitor: 7. 20Politics in America, 1990: 1347. 21Joanne Omang, “House Science Unit Votes to Pull Plug on Nuclear Project,” 8 May 1981, Washington Post: A20. 22Martin Tolchin, “Senate Vote Virtually Kills Clinch River Atom Reactor,” 27 October 1983, New York Times: A24. 23Politics in America, 1990: 1347. 24Barbara Gamerekian, “U.S. and Soviet Legislators Are Planning to Debate on TV,” 12 April 1987, New York Times: 12. 25John Dillin, “GOP Likely to Gain Senate Seats,” 18 April 1990, Christian Science Monitor: 1. 26Judy Mann, “Defense Queens,” 21 June 1985, Washington Post: C3. 27Catherine Foster, “Rhode Island Senate Race Takes Politeness Prize,” 26 October 1990, Christian Science Monitor: 7. 28Ross Sneyd, “Democrats Sweep Rhode Island from Governor’s Mansion on Down,” 7 November 1990, Associated Press. 29James M. O’Neill, “Environmentalist Schneider Finds Bully Pulpit in New Role,” 19 June 1994, Providence Journal Bulletin: 2B. Videocassettes: 1990, 35 commercials on 4 videocassettes. These commercials were created during Congresswoman Claudine Schneider's campaign for the 1990 U.S. Senate election in Rhode Island, Republican Party. Papers: ca. 1973-1990, 93.5 linear feet. The papers include official records from Claudine Schneider's five terms in the U.S. House of Representatives from Rhode Island. The papers contain correspondence, legislative files, press releases, news clippings, campaign material, subject files, and material documenting Congresswoman Schneider's opposition to the Charlestown Nuclear Power Plant in Rhode Island, as well as the Clinch River Breeder Reactor Project in Tennessee. The collection also includes audio and video tapes, photographs, and memorabilia. A finding aid for the papers is available in the repository and online. "Claudine Schneider" in Women in Congress, 1917-2006. Prepared under the direction of the Committee on House Administration by the Office of History & Preservation, U.S. House of Representatives. Washington: Government Printing Office, 2006.